Andes Materiales works with the Community of Salasaca in Ecuador improving their local techniques for the production of fashion supplies. Our mission is to become the pioneers in the region in the production of sustainable fashion supplies. Andes Materials takes care of the ovine raising and agricultural practices. The raw material is processed with improved local techniques into products such as string, wool, pigments, fabric, etc. These products become part of a portfolio of supplies ready for exportation. Branding process to make Andes Materials competitive. Andes Materiales works with the Community of Salasaca in Ecuador improving their local textile techniques for the production of high quality sustainable fashion supplies. We give a new value and recognition to traditional textile techniques that otherwise would be lost in modern times. We work to improve the care of the ovine raising and agricultural practices. 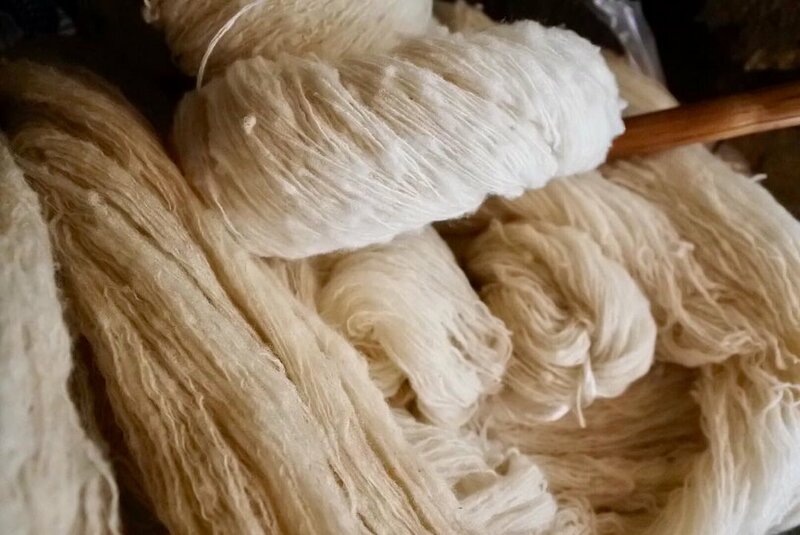 This raw material is processed with improved local techniques into our portfolio products such as string, wool yarn, pigments, fabrics, etc. Variety of purples made with natural pigments. We are fair trade project with the potential to generate employment to 12000 people in Salasaca. Working with local knowledge facilitates que curation and customization of wholesale orders. Meanwhile, our clients can focus their efforts in the design of clothes. In 2016 we won a 50k grant to develop our portfolio of products.